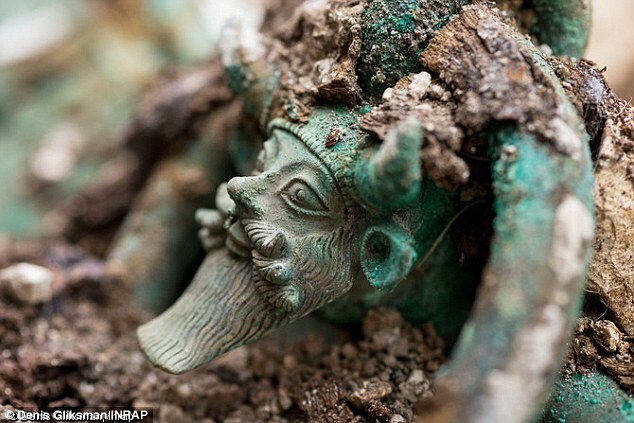 The tomb of an Iron Age Celtic prince has been unearthed in a small French town. 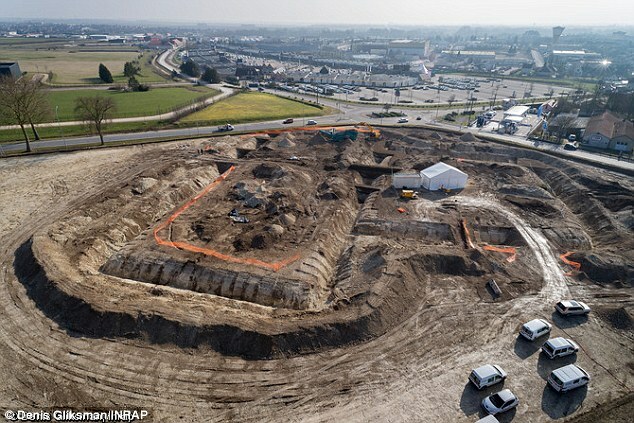 The ‘exceptional’ grave, crammed with Greek and possibly Etruscan artefacts, was discovered in a business zone on the outskirts of Lavau in France’s Champagne region. The prince is buried with his chariot at the centre of a huge mound, 130 feet (40 metres) across, which has been dated to the 5th Century BC. A team from the National Archaeological Research Institute, Inrap has been excavating the site since October last year. They recently dated it to the end of the First Iron Age – a period characterised by the widespread use of the metal. Its discovery could shed light on Iron Age European trade, researchers say. The 2,500-year-old burial mound has at its heart a 14 square metre burial chamber, not yet opened, of an ancient royal. ‘It is probably a local Celtic prince,’ Inrap president Dominique Garcia told journalists on a field visit. WHAT WERE THE KEY FINDS? The prince is buried with his chariot at the centre of a huge mound. His chamber has not yet been opened. This biggest find was a large bronze-decorated cauldron that was used to store watered-down wine. The cauldron has four circular handles decorated with bronze heads that depict the Greek god Acheloos. Another interesting discovery was a perforated silver spoon that was part of the banquet utensils, presumably to filter the wine. 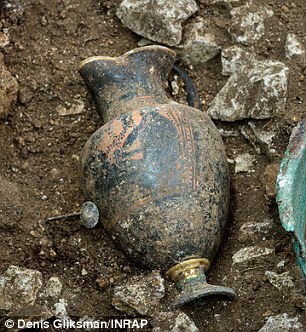 The mausoleum contained a decorated ceramic wine pitcher made by the Greeks. 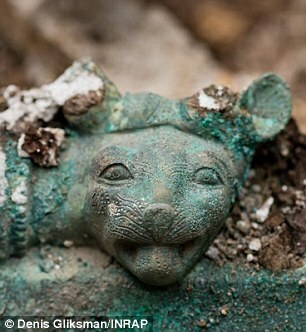 The most exciting find, he said, was a large bronze-decorated cauldron that was used to store watered-down wine. It appears to have been made by Etruscan craftsmen from an area that is today in Italy. The river deity is shown with horns, a beard, the ears of a bull and a triple mustache. Eight lioness heads decorate the edge of the cauldron. Decorations on the vessel reveal the god Dionysus, lying under a vine and facing a woman. 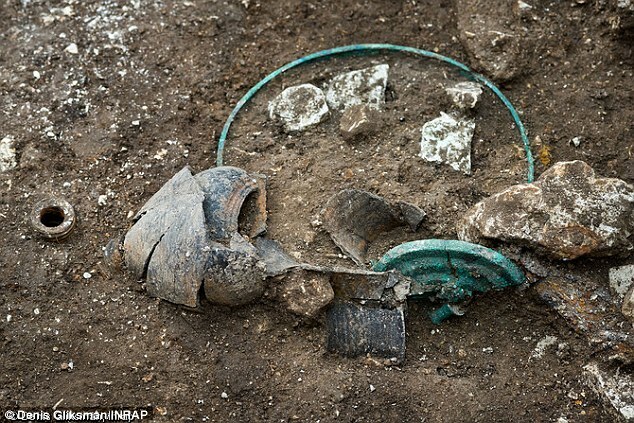 The archaeologists also found remains of a iron wheel, from a chariot buried with the prince. Another interesting discovery was a perforated silver spoon that was part of the banquet utensils, presumably to filter the wine. . . . .